Morocco was once the western extreme of the Arab world. In fact, its name in Arabic al-magrib means “the west.” As with any edge of an empire, it represented the most rugged elements of its parent culture. There were located the most intrepid explorers. There the most exotic combinations of local culture combined with that brought from afar. The indigenous people of Morocco (and of northern Africa) are known as the Berber. Among the traditions of the Berber that thrived with the coming of the Islamic conquering of northern Africa in the seventh century was their rug making. In fact, Berber carpet has come to mean a particular type of weave used in carpet manufacturing that dates back millennia to those indigenous people of northern Africa and Morocco, and is considered by many to be one of the more luxurious types of floor covering available. No history of Moroccan rugs would be complete without including some of the history of the people who first made them. The ancient Berber people had both large populations that had settled in villages as well as nomadic populations. The Phoenicians interacted with the Berbers as they traded with the Iberian Peninsula, and imparted some elements of their culture and structure to the Berbers who strove to remain independent from Punic/Carthaginian culture. In fact, the Berbers were so numerous and such skilled horsemen and warriors that Carthage had to pay tribute to their kingdoms to be able to trade in their territories. As time passed, the Carthaginians grew to be the dominant culture and the Berbers were not able to continue their complete independence. They became a lower class of people in Phoenician culture, but they did not entirely assimilate (Berber culture is still celebrated today). As Rome grew to prominence in Northern Africa, they recognized the Berbers as a powerful group and allied with them militarily. Carthage was hard on the Berbers and did not “bind her subjects to herself, as Rome did", thus leading to revolts and unrest among the Berbers. In the middle of the seventh century, the Arabian spread of Islam began in the Maghreb (what would later be called Morocco). Many of the Berbers converted to Islam and aided the new caliphate both militarily and societally. The Arabs turned out to have many of the same attributes as the Phoenicians had so many centuries before: they enslaved the Berbers and treated them as lower class Muslims. This treatment lead to an inevitable revolt under a sect of Islam that promised a more egalitarian culture. Muslim Berbers invaded the Iberian Peninsula and the relationship between Islamic Arab culture and indigenous Berber culture continues to the modern period and the current day. As North African countries established their independence from their European colonists, they codified Arabic as their official language, yet Berber is now an official language in Morocco and taught as a mandatory subject in all schools in the country. So…how does this complex history relate to Moroccan rugs? In various ways, the history of the Berber culture can be seen in its weaving and its rugs. Because the Berber culture was largely based around herding, there was always wide access to wool for weaving and the plants needed for creating dyes for the wool. Each individual tribe had its own images and designs, colors and names for the rugs they would weave. The influx of cultures and peoples from the Mediterranean and Arab worlds brought styles and colors and patterns to differentiate the traditional Berber work from the influence of international designs. The distinction between Urban (Arab and international) and Rural (traditional and local) Berber rugs was well defined and is still seen in their imagery and design. Berber carpets were not popular in European and American markets until recently, so their authenticity of design and manufacture is more intact than many other styles of rugs. The commercialism that has made designs from other parts of the world more popular, and thus more mass-produced, has not plagued Berber and Moroccan rugs. Urban examples have influences from the Middle East and Anatolia and show both pile and flat weave techniques. These were designed to be used in the houses of western Arabs. In contrast, the Rural rugs were designed for and made by nomadic peoples, so they would be lain upon the earth and their weave would depend on the environment in which the people who made them lived. They retain the colors and patterns of specific tribes to whose lineage they can be traced. 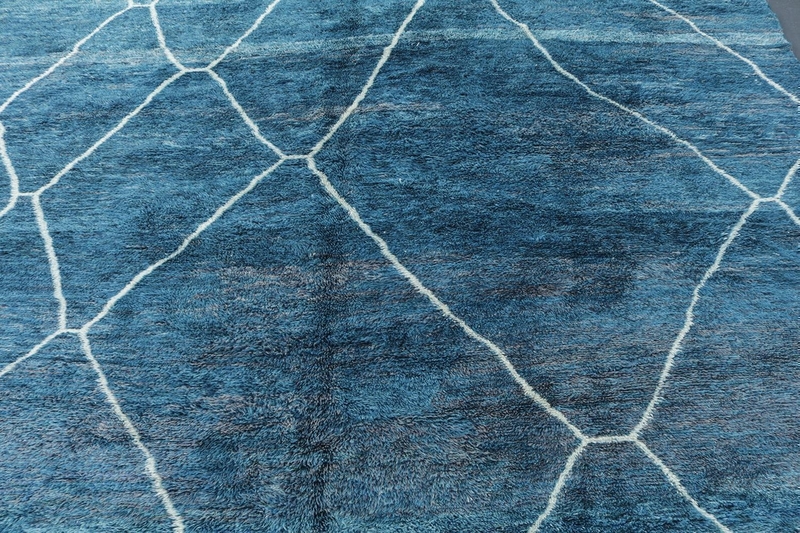 Berber carpet has become synonymous with high quality and durable weaving techniques. It is mentioned by name on television programs and in movies to inform the audience of the quality and heritage and value being displayed. From Craig T. Nelson to Kelsey Grammer, actors have portrayed characters who have referred to their Berber with reverence and respect. While what is thought of as Moroccan rugs and Berber carpet are certainly two separate images, they come from the same place: the Berber people in north western Africa dating back millennia and incorporating native and indigenous cultures and patterns and colors as well as the influences of multiple cultures from the Punic to the Arabic. In common to both, Berber carpet and Moroccan rugs are high quality, beautifully designed and colorful, replete with a rich history, lineage and culture. Come to The Rug Warehouse to explore our selection of old, antique, vintage and new Moroccan designs and let yourself enjoy the heritage and craftsmanship of a truly useful piece of art. Form where do the designs and symbols originate from: are they Gnawa, are they Berber, etc? Most of these rugs are 30-50 years old and I would presume they are not exactly commercially made except for a small ethnic people, say up in the Atlas? I suspect there is or will be a commercial products of these types, except that will foul the artists intention and imagination. 61 1 Yes, but the contemporary rugs sold on 1st Dibs (stupid name) I would like to know... Form where do the designs and symbols originate from: are they Gnawa, are they Berber, etc? Most of these rugs are 30-50 years old and I would presume they are not exactly commercially made except for a small ethnic people, say up in the Atlas? I suspect there is or will be a commercial products of these types, except that will foul the artists intention and imagination.